Last month Roubi L’Roubi and his partner Pierre Lagrange bought Huntsman. Roubi is a couturier who cuts and makes clothes for men and women. Perhaps understandably, there were fears that he intended to turn Huntsman towards womenswear, ready to wear or fashion. Last week I sat down with Roubi to ask him about his plans. How have things been since the purchase was announced? It’s great, friends keep dropping in and wanting to look around. They are fascinated by the tailoring and the work rooms – so few people realise that suits are still made that way. Huntsman has such a strong brand, particularly in the US, but there’s a job to do to communicate the work and the value of bespoke. When did you first become aware of Huntsman? During an open house a few years ago. I had already worked with other people on Savile Row, such as Henry Poole for which I designed a womenswear collection, but I didn’t know Huntsman very well. I think most men associate ‘collections’ with ready to wear. But you work in couture, where everything in a collection is made bespoke for each customer. Exactly, and that’s important to get across. So I am working on a collection at the moment for Huntsman, and there may be some elements of ready to wear, but it is mostly meant to inspire men to have different things made bespoke. Which is what you do already from your studio on Bond Street? Yes. We make for both men and women. I have always made for men my entire career. Couples often come in together, and I make dresses for women, suits for men. That happens a lot around racing events like Ascot, for example. And over the years I’ve made men’s pieces for the clergy at St Paul’s Cathedral, for conductors, singers and actors. But will you be introducing more womenswear to Huntsman? No, not at the moment. I’m working on a men’s collection and there are no immediate plans for womenswear. There are a few women’s busts around the shop with new pieces on, some of which are mine, but they were always there. 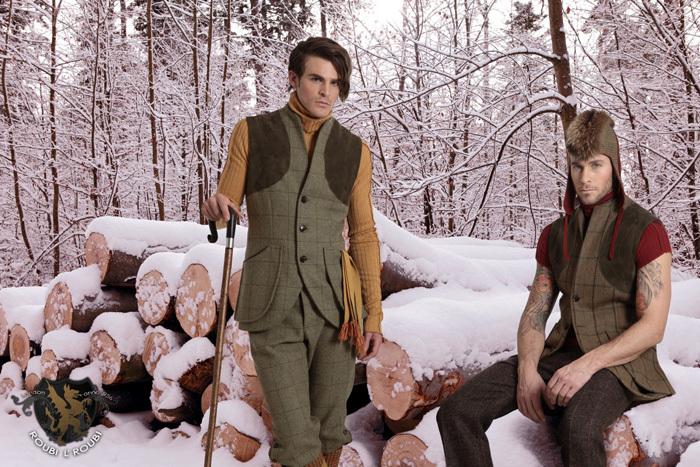 What will the menswear collection include? 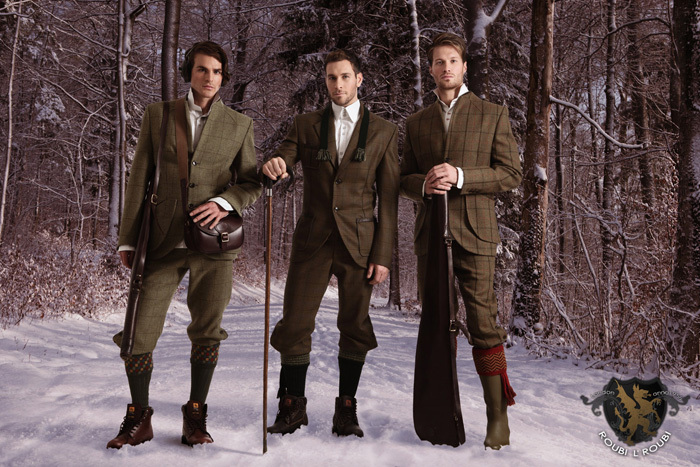 It will be hunting clothing – something I have an affinity for because I both ride and shoot. There will be jackets with action backs, breeches and shooting vests. I’m a big fan of a shooting vest: it is cut the same as a jacket, just without the arms, and gives you the most range of movement. I wear one to shoot usually, over knitwear. Are there any bespoke cutting techniques that you will work into the collection? There are a few, yes. For example the action back on a shooting jacket is normally cut with the pleat close to the top of the sleeve. I find that it works better if the pleats are a couple of inches closer to the centre seam. Having them more central means there is less bulk around the shoulders, but they function just as well. On the ready to wear suits, I find that there is normally excess cloth gathering under the collar at the back, because they are cut for someone that stoops a little bit. Obviously the angle won’t be perfect for everyone – you have to set it where you think the average is – but I think it’s a little too stooped at the moment. The sleeves could also be a little longer. They are all unfinished, so they can be shortened to any length, and I think they should start longer. A surprising number of people have long arms. We should have the option of flat-fronted trousers too. Will you be working on Savile Row now? Yes, though probably downstairs. I like to be close to the tailors. There’s so much that depends on that close communication. But you will carry on cutting women’s couture too? Yes, although it will all be made at our Bond Street studio. The differences between cutting men’s and women’s are interesting. Heavy cloths often don’t work as well with women because you can’t put the curves in it. No heavy tweeds, no chalk stripes. It will be interesting to see customers respond to seeing more examples of menswear pieces around the shop. And hopefully you will bring some genuinely new ideas. We wish you luck. You can follow the discussion on Interview: Roubi L’Roubi, Huntsman by entering your email address in the box below. You will then receive an email every time a new comment is added. These will also contain a link to a page where you can stop the alerts, and remove all of your related data from the site. Mr l’roubi looks v elegant in the photo but the suit doesn’t look like a huntsman to me ..am I wrong? Interesting, he likes to crossdress his clientele. Ha! Thanks, your subbing is better than mine. I can see why he wants the rtw to come with longer sleeves! While not a fan of his look (just the Hermes buckle really) I have seen his suiting for women firsthand and think its fantastic and as soon as my wife is ready to splash out I think we will head over to his bond st place. Simon, I liked your idea of buying bespoke for your wife, maybe it might work for me a oil the wheels for further bespoke purchases for me! Is ‘lack of original ideas’ the real reason behind Huntsman’s financial difficulties up to this point? Or is it mis-management, diluted quality, overcharging, and continual unease about the direction of the company (i.e. changing hands every other year). If you were a prospective huntsman customer over the past decade there were too many good reasons not to seek a less expensive alternative. I have no reason to doubt Mr l’roubi’s good intentions in purchasing huntsman but his lack of assurance in recent interviews that he is interested in preserving traditional bespoke of the highest quality in a way that honours huntsman tradition – does not bode well for no. 11. I’m sorry if that does not come across in the interview, it is something that is immediately obvious as soon as you meet him. It always staggers me how people complain about the lack of investment into tailoring, and then immediately assume the worst as soon as someone actually does. What amazes me is that, according to the Telegraph, L’Roubi and Lagrange could buy the firm’s assets for little more than 1m GBP. These SR firms look so mighty from afar; how can they be worth so little? Is it because the chief assets of the firm walk out the door every evening? 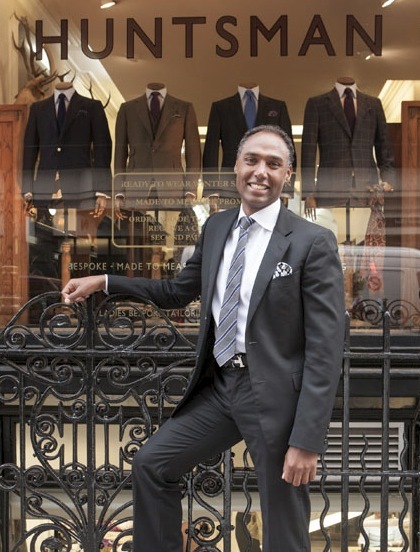 So sad . . . . Huntsman, the iconic and arguably best firm in Savile Row is to be run by a dilettante ladies wear designer doing “collections.” Colin Hammick must be spinning in his grave.